After breakfast, Adam took their troop for a hike. Jillian and I sat by the campfire and recorded a video that she'll use sometime in the future at her website. We chatted about travel (or course) and blogging (of course) and early retirement (of course). But then Jillian steered the conversation in an interesting direction. We were talking about how retirement isn't always what people expect it to be, whether they retire early or not. A lot of folks quit their jobs to find that they're life is without purpose, that they're bored. “That's why I encourage my readers and clients to pursue passion income,” Jillian said. 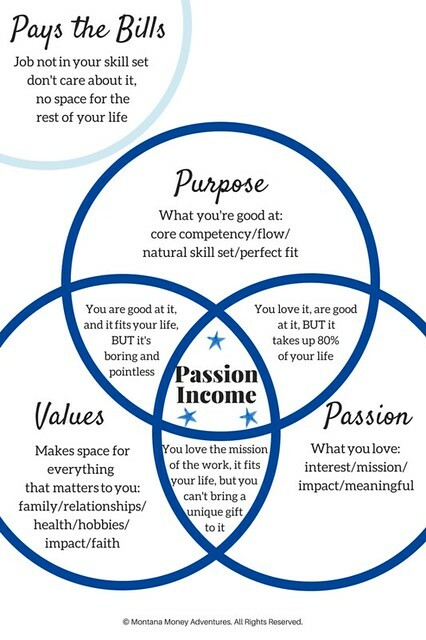 “Passion income? Do you mean passive income?” I asked. I said good-bye to Jillian and her family, then headed home. But along the drive, I continued to think about the notion of passion income. It's an idea that I've espoused for a while but never had a term for it. When I got back to the house, I dug through the archives at Montana Money Adventures to read more about the concept. 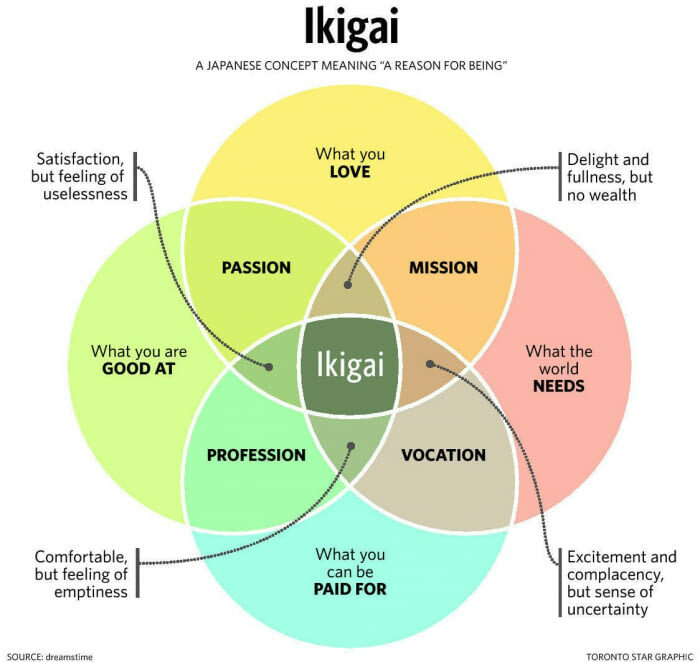 Jillian says that passion income is derived from things that (a) are in your natural skill set or match your core competency, (b) you love the outcome and feel like you're making a difference, and (c) give space for other important things in your life. 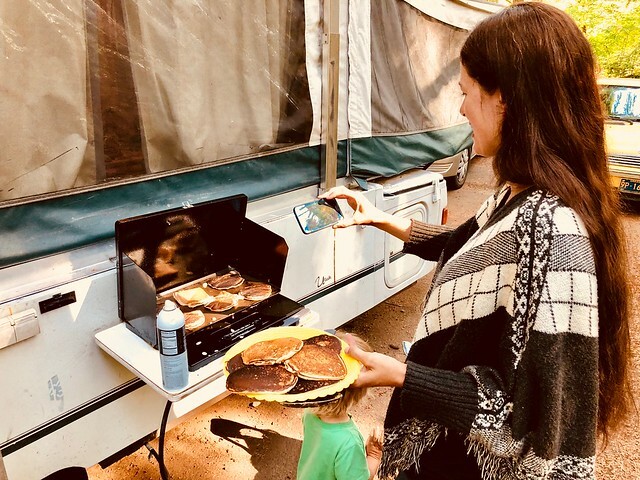 While neither Jillian nor I would argue that you should “do what you love and the money will follow”, I think we both agree that in an ideal world you'd make money by doing something you enjoy. This might be difficult if you're currently in the middle of a specific career trajectory, but it's much easier after you've retired. After you've left the traditional workplace, you have the freedom to make choices more aligned with your self and your vision. Pursuing passion income — whether it's through art, a hobby, or work in your community — can be an excellent way to take pressure off your retirement savings while also giving yourself a sense of purpose. Thinking about it, that's really why I bought back Get Rich Slowly. My hope is that this blog will be a source of passion income (not passive income). And once I get the monetization thing figured out, I think it will be. The great thing, Jillian says, is that you can pursue both passive income and passion income. That might mean doing something — painting, writing a book — that fits in both categories. Your work might fit in that passion income sweet spot, but then produce residual passive income in the future. Why even worry about passive income and passion income? Recently, I wrote about the struggle some people face to figure out how much to spend in retirement. While some people overspend, there's a sizable population that underspends. They're afraid to touch their nest egg. 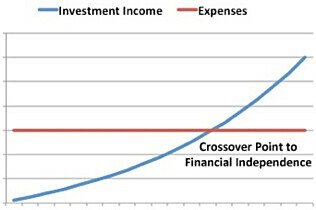 Passion income alleviates the pain of spending. You get to work at something you love while also earning some money. And spending this money isn't painful, unlike spending out of your investment accounts. Another benefit of passion income? If you're able to generate ongoing revenue with work that you love — whether it's part time or full time — you're able to quit your career much sooner than you would on a traditional early retirement path. If you can earn $1000 per month by building picnic tables, for example, that's $300,000 less you need to save for retirement (given standard assumptions). As I near fifty, I'm still intrigued by the idea of passive income. I probably always will be. But the older I get, the more vocal I am that people should consider creating sources of passion income. Finding a way to earn even a little bit of money by doing something you love can not only be fun, but it can also help you reach retirement sooner — or make your current retirement less stressful. There are 16 reader responses to "Passive income vs. passion income". I’ve never heard that term but love it. Jillian is clever indeed. My graphic arts side hustle definitely qualifies as passion income. I love doing it and it’s earning me a couple hundred bucks a month. Cooler yet, I can stop working on it and doing new designs at anytime and my stuff will continue to sell, so it can also become passive as well if I choose. And kudos to you on the book sales, selling 30 – 50 books a month is no small feat! That’s awesome! Sounds like the perfect passion income. And that is such a great skill set to have. I like what Olga is doing with her knitting. The 10% sales covers the cost of her hobby that gives her so much enjoyment. It also provides a useful product that saves money from being spent on garments or gifts. My hobby of passion is growing useful plants. When I retired I decided that my garden had to pay for itself. So I sell a few plants that cover the cost of fertilizer and garden chairs etc. I think I also get some passive income from my breadfruit tree. The fruit grows without my help and a few people come by and pick them for $1 each. That money goes into my travel account. I really enjoyed reading your article. It is true that when trying to make passive income, one should really focus on making a passive income which at the same time is something with which you are passionate about. So many finance gurus try and teach us to focus on only trying to make the passive income and retire to the beach; nothing about the passion behind the income. And well done as well for your book sales. I really like this topic of passive and passion income and would like to see more articles and discussions on this. We currently have a couple different income streams but I would like to increase that by doing some passion work. I think my biggest challenge is lack of confidence. I am also worried about liability- my ideas include things like hosting children’s birthday parties but what if someone gets hurt? Some discussion along those lines would be great. My sister is a great example of someone who makes passion income. After she retired, she took a photography course, realized she had a good eye and enjoyed it. She got involved with an artist’s cooperative in the Oregon coast tourist town she lives in and now she’s a top seller there and an award-winning photographer. “Passion Income” is a wonderful concept! Something everyone should have a goal (and the pancakes look great to me). I first encountered “Passive Income” from reading Jane Austen novels when I was a girl. These novels are all about money. I was trying to figure out what it meant when a heroine “had an income of 400 pounds” or lost the chance to have “1,000 pounds settled on her.” What? I knew it was important and good, but how exactly did that work? I finally put it together when my great aunt took me out to the local drugstore for a soda and insisted we buy Coke not Pepsi because she held stock in the company. She explained stock buying to me. In my Southern family, the stocks to own were: Coca-Cola, Reynolds Aluminum, and (ugh) Phillip Morris Tobacco. Finally I understood how it was that she, unlike some others in my family, did not have a job or any visible means of support (to quote an ancient brassiere commercial). Eureka! My great aunt had the invisible means of support—-investments! 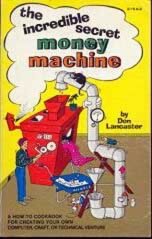 I too was lured by the passive income (aka residual income) aspect of MLM in my naive 20s back in the 90s. It did expose to me and teach me the potential power of passive income. I am very passionate about real estate and music. Both now are sources of good passive income, rentals and royalties. I think to truly create passive income it must involve something you are passionate about – they intertwine. The trick is to find passionate interests that actually can pay! Like anything, it takes work and patience but is possible. Great content. I was just thinking about this topic this summer. I’m an English teacher in Spain, and we’ve got summers off. Boredom always sneaks in at some point, and I was wondering how I’d ever cope with retirement. Also, great to have you back, JD. I’ve always been a silent reader, but I love this more personal content, which is the reason I originally started reading. 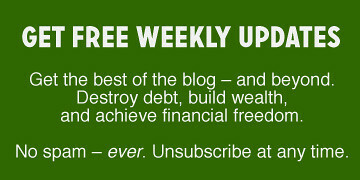 So many personal finance blogs go the corporate route, but they don’t have the same voice and soul. Passion income is a great term! Definitely something to strive for. You mentioned : “•My top source of passive income comes from interest and dividends on my investment portfolio.” Can you share where you have invested your money to obtain dividends? I’m hearing the concept of passion income for the first time. However, I think the toughest part is to find how to make money from our passion. And, most of the times people are not able to proceed further because they don’t know the right direction. Can you share any tips on finding the right mentor or like-minded people who share the same passion as us so that we can learn from them?